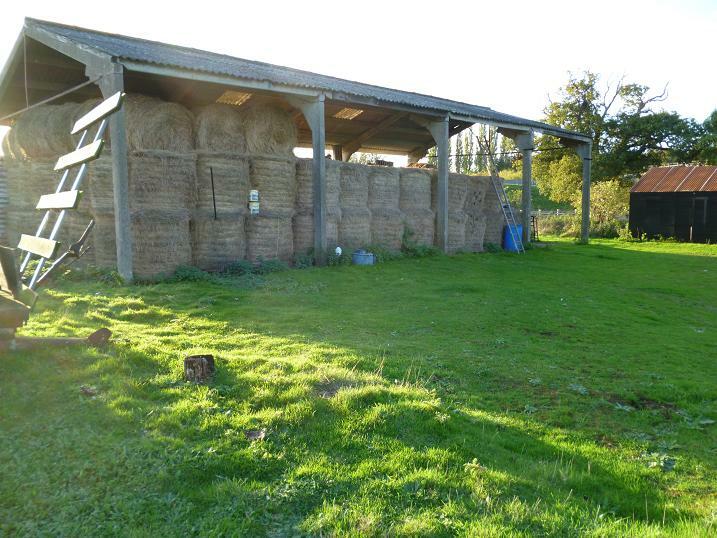 A chance meeting this autumn resulted in a new shooting permission and a knock-on effect, as I was recommended to a series of small farmers with their land infested and being ruined by rabbits. Driving down the lane to the most recent, I could see rabbits grazing on either side of the road, while others hopped idly out of my way. At the farmhouse I was met by the lady owner, who gestured to the surrounding garden, where I could see several rabbits, digging and nibbling. “Just get on with it!” she said. 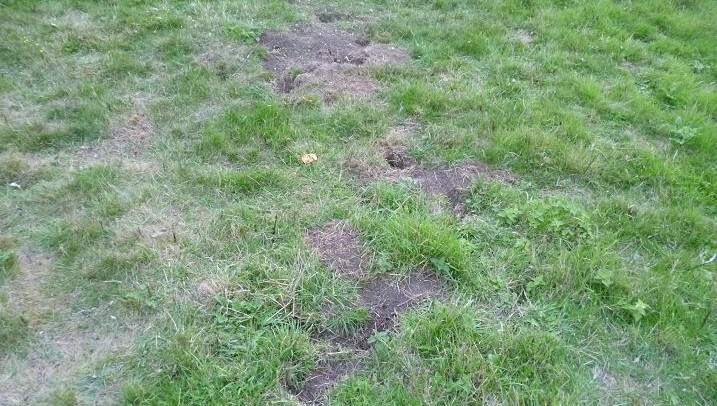 Evidence of the destructive power of these furry rodents was everywhere, with burrows in the middle of paddocks, which were in a sorry state with more bare patches than grass. 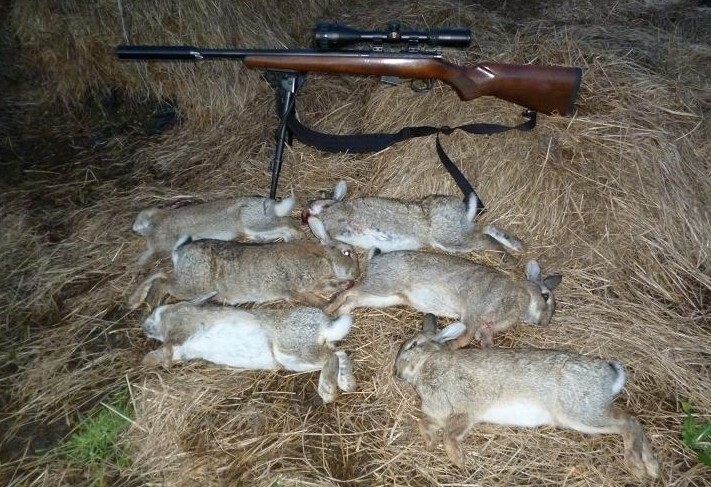 That brief first visit put a dozen bunnies in my bag, as I walked round among the farm buildings with my Magtech semi auto .22lr, catching out an unaware rabbit at every turn, as they sat out in the warm evening sun. That was two months and at least forty rabbits ago, the days have shortened, the leaves gone and the rabbits got scarce. 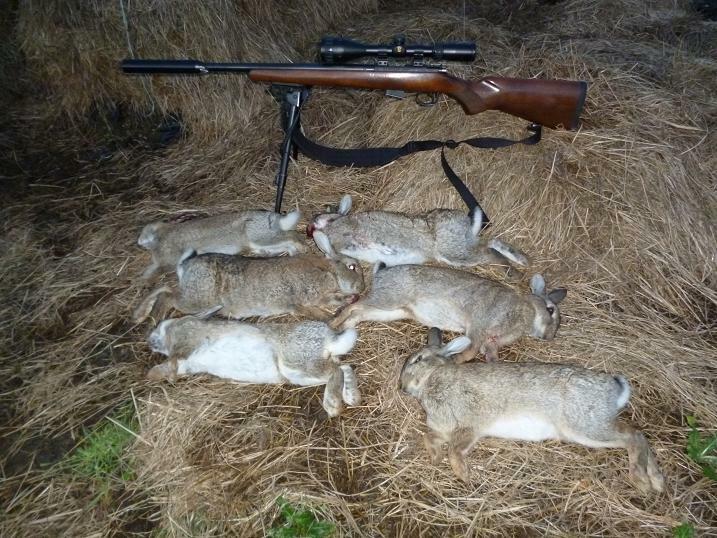 Following a prolonged wet spell, I’d given my shooting exploits a rest, the land owners were happy with the free pest control and I was resting on my laurels, when one of my butchers phoned with a request for some more rabbits. 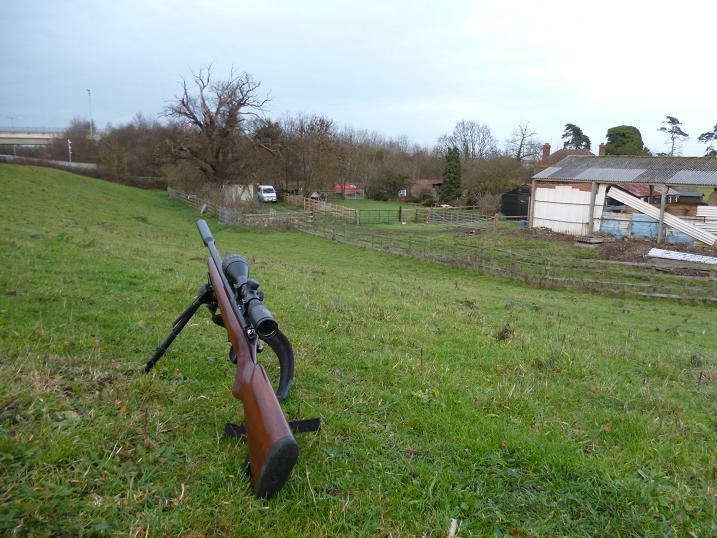 With high ground overlooking much of the farm, I decided that a return visit with the CZ 452 HMR would be needed, arriving in the early afternoon with the sun already low and about two hours of light left. Taking up position, I had a bramble hedge on the far boundary 120 yards away, well within range of the tiny .17 inch diameter bullet, while I had a clear view over a small paddock and an area covered with brambles alongside the barn, which had become a general dumping ground and is pock marked with burrows. 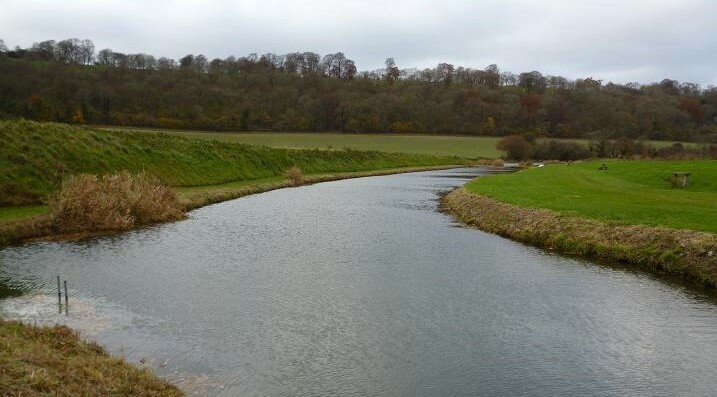 The first movement came from the far brambles and a brown shape popped out among the nettles in the dip. 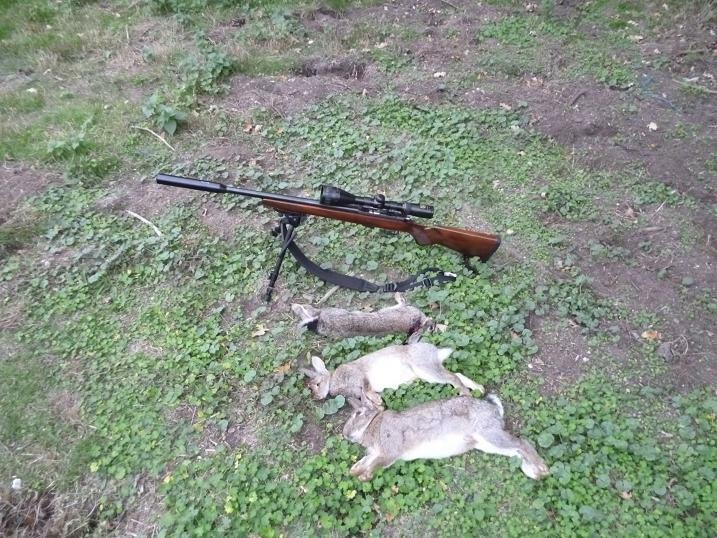 With the scope at maximum 12 magnification, I waited for the rabbit to raise it’s head for a clear shot, squeezed the trigger and watched the death kick as it leapt skyward. At least one for the butcher. 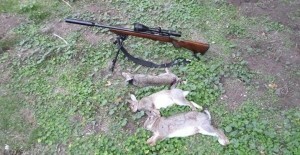 The HMR is a fantastic rifle, shots like this at over a hundred yards on a day with no wind go exactly where you aim them. This was a perfect vantage point and I watched another hop across the path and through the far gate into the small paddock and begin feeding. Lifting the rifle round to get a bead on it made for an awkward shot, but number two flopped over without a kick. 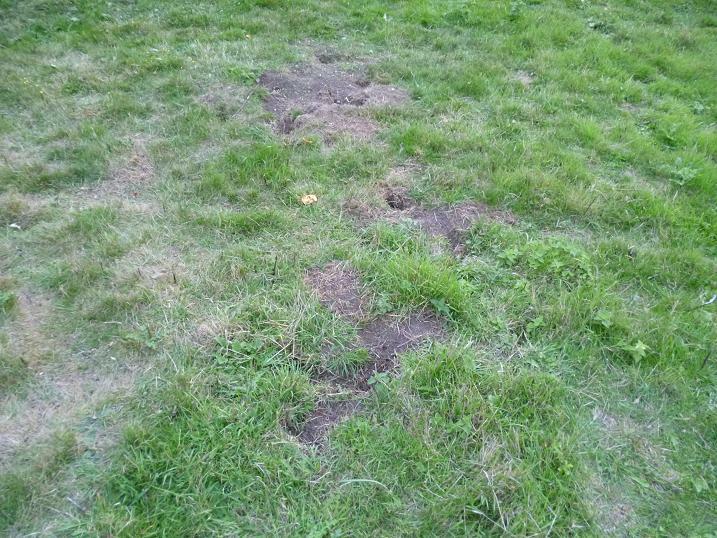 The crack from the rifle startled an unseen rabbit from it’s cover along the nearside of the paddock and it ran into the middle and stopped, ears up. Too late, it was dead. It was now 3pm and the light was fading fast, when target number four came out from alongside the barn. 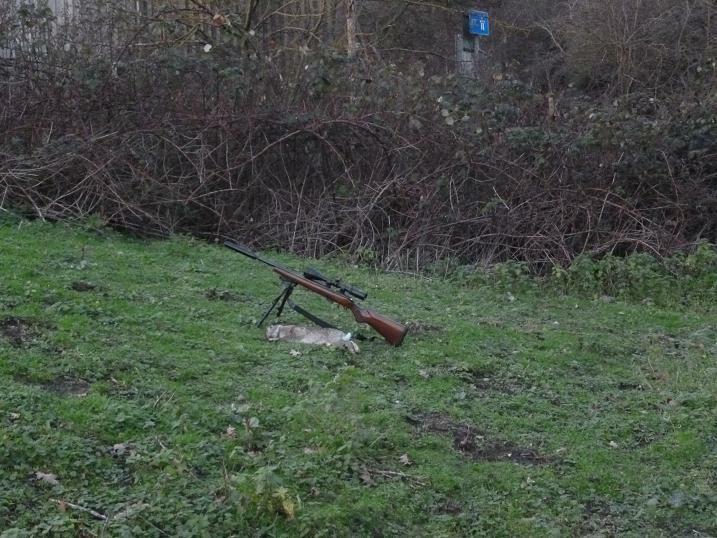 Getting the rifle to deflect low enough for a shot, was uncomfortable and I quickly reduced the adjustment on the bi-pod legs, while the rabbit made it’s way conveniently towards the near paddock gate in the perfect position for a shot. Stop, move, stop, crack! The fourth. Four would have to do, by the time I’d picked them up and they were paunched, it would be dark. I looked back towards the top of the hill and saw a shape. 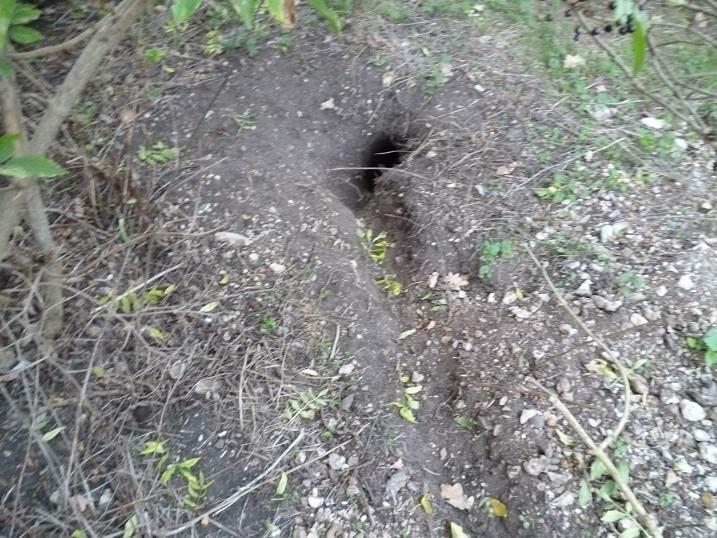 Another rabbit had come out of the brambles on the crest. How long had it been there? 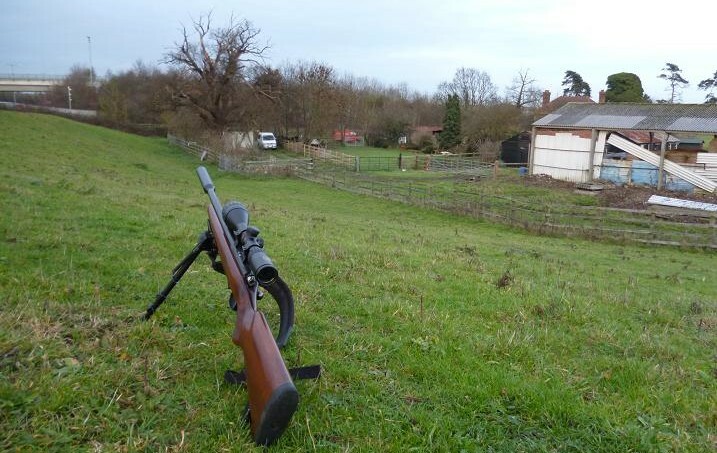 A quick lift of the rifle back into position and I could see through the scope a confident feeder, head down. Another perfect shot and I was up and making my way to collect the two at that far end. The rabbits in these brambles are usually out feeding on the hill, when I drive into the farm, but disappear the moment I get out of the van and long range sniping is the only way to get them now. Walking back with these two, a white flash of a bobbing tail alerted me to a rabbit making for the cover of trees and I rested on some hay bails for a quick shot, as it stared back at me. Number six collapsed back into the nettles. Picking up this last one, I quickly collected the three from the paddock and carried them back for a trophy photo, before preparing them for the butcher, who would still be in the shop on my way home. A much better result than I thought possible two hours before. 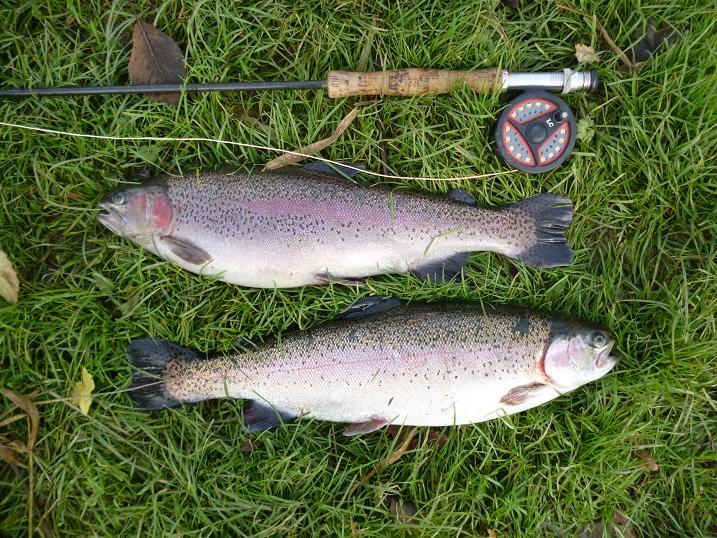 Moorhen Trout Fishery rainbows becalmed. 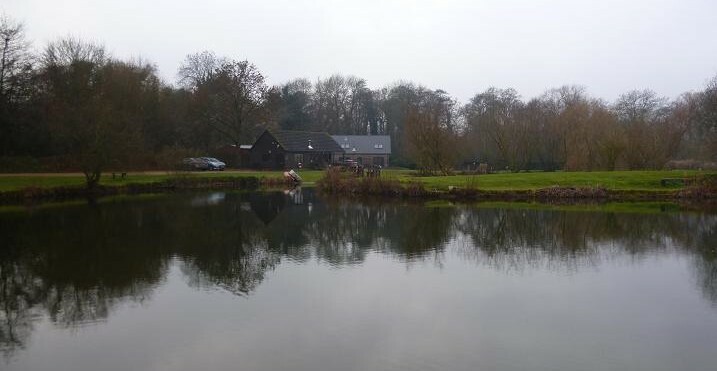 With confidence boosted from a successful day at storm swept Meon Springs last week, friend Peter and I travelled a few miles further south to the village of Warnford and Moorhen Trout Fishery this week, to find a complete turn around in the weather had resulted in flat calm conditions. Meeting up with Michael, another one of Peter’s cronies, we had the water to ourselves and to a man we opted for Bloodworm nymphs under indicator yarn. Crossing the wooden bridge to the island, I set my indicator to three feet, casting hard to the base of a tree along the carpark bank, where the roots offered some cover in the crystal clear water and waited for the yarn to disappear. The yarn rotated and bobbed. That was it. There were fish here, but they were choosy. Another cast and the line stopped on the drop with six inches to go. Hung up on a root? The line trembled, then two inches of leader dipped beneath the glass like surface. A lift of the rod. Nothing. 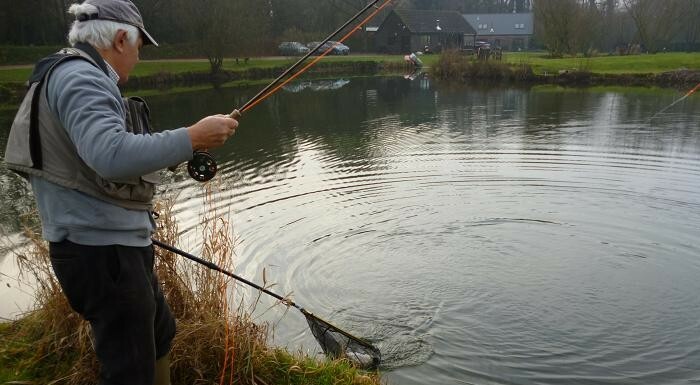 This was as fussy as fishing real bloodworm with the pole on a winter canal. The sound of a fish thrashing the surface, heralded Michael breaking his duck with a hard fighting rainbow from the open water. 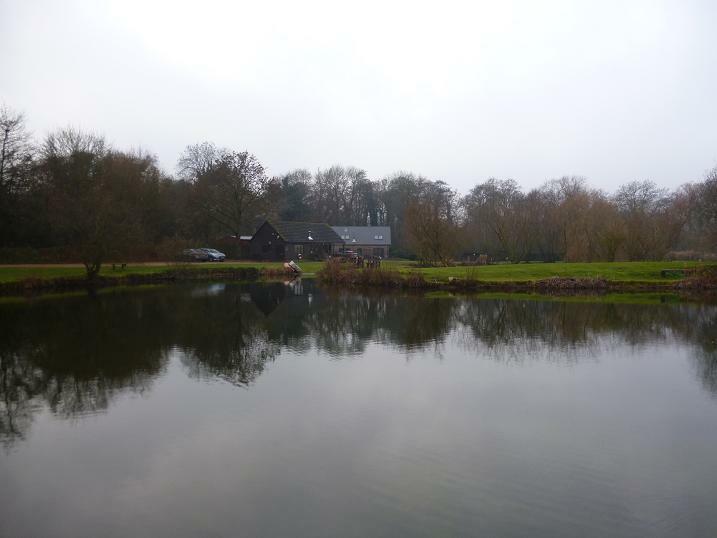 I moved round the island to face him and could see that he was fishing his bloodworm at 18 inches on a tight line and striking at any movement of the indicator. Keeping my original depth setting, I followed suit and spent a frustrating half hour missing the slightest of takes, briefly making contact a couple of times, while Michael landed another two fish. 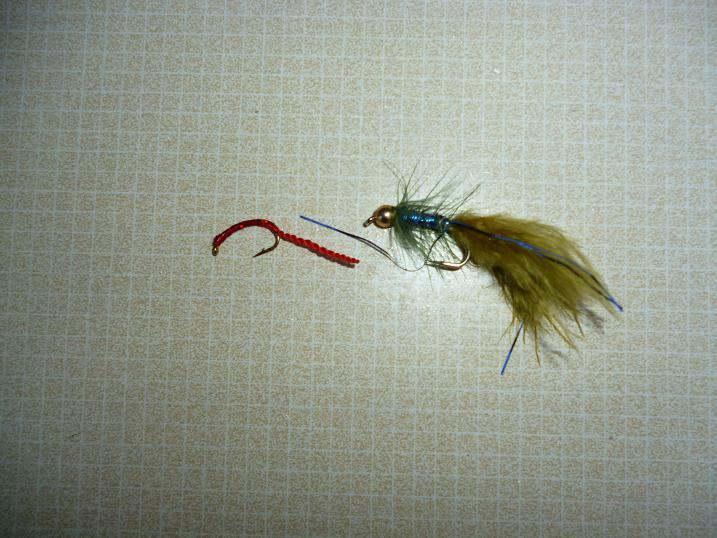 For me a change of plan was needed and an old Moorhen favourite the Blue Flash Damsel nymph was substituted, with the leader greased within two feet of the damsel, instead of the indicator. My first cast was allowed to sink for ten seconds, before I began the slowest of retrieves, watching the leader for any pause. It held and I lifted into solid resistance. 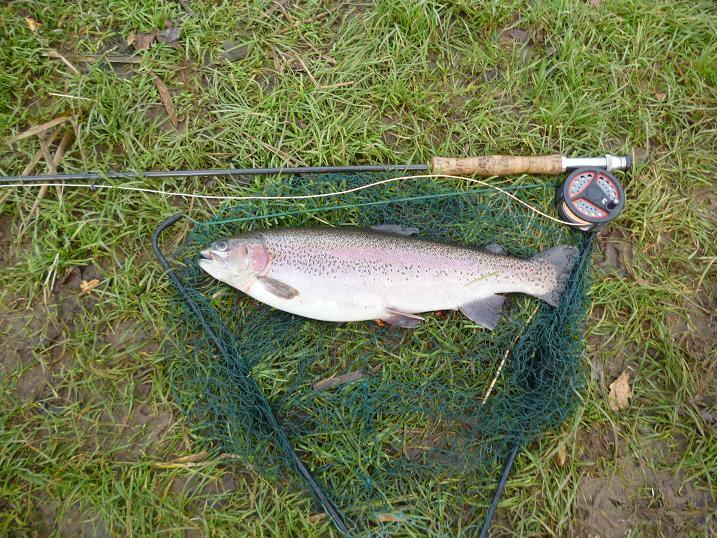 At last I was in and playing a determined, full tailed 2lb rainbow, able to follow it’s every move to the net in the clear water. The hook, firmly set in the scissors of the rainbow’s jaw, belied the minimalist take. I’d used a barbless to aid hooking, but paid the price ten minutes later, when, after missing more takes, I was in again to a much bigger fish, which spun and dived trying to get rid of the hook embedded in the tip of it’s nose, shaking free just short of the net. 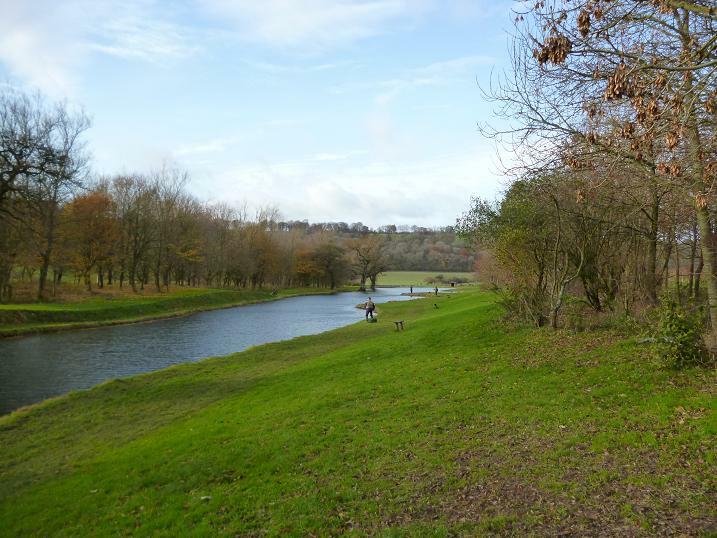 Michael was now at his four fish limit, while Peter, who had done a tour of the fishery, had not succeeded in landing a fish, despite several on and was having “one of those days”, his confidence evaporating, while suffering wind knots, or hooking the shrubbery. We’ve all been there! My frustrations continued, with follows almost to the bank, but at least I was having some response to my efforts and I knew it was only a matter of time, before one held on long enough. It happened, just as Peter, with relief, slipped the net under his first fish. A series of gentle plucks, as the fish nosed the long tail of the nymph, developed into a hold and the hook was set into a boiling rainbow, which did all it could to break free. As it came close, I could see that once again the hook was in the very tip of the hard jaw, but this time, despite it’s gyrations, safely slid it into the net, where relieved of it’s pressure, the hook dropped out. 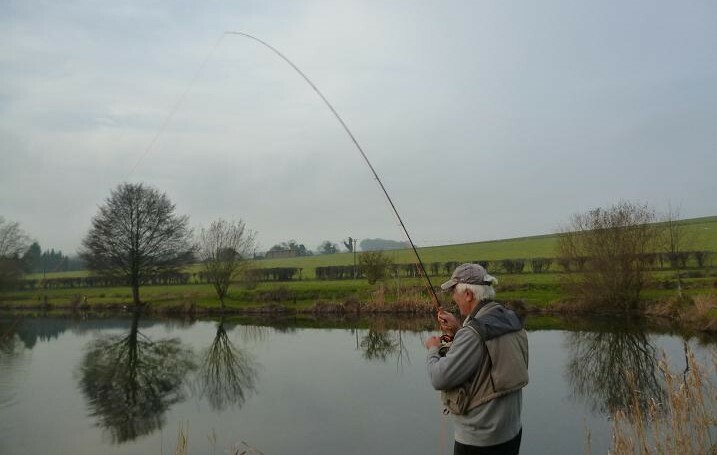 This larger fish completed my two fish limit and after bagging them at the clubhouse, I walked round to give Peter moral support in his efforts to catch his second. Michael was already there and offered Peter one of his hand tied Blue Flash Damsels, which began to get tippy, tap takes from the off. We watched each pull and tap, until, yes, he was playing a fish. 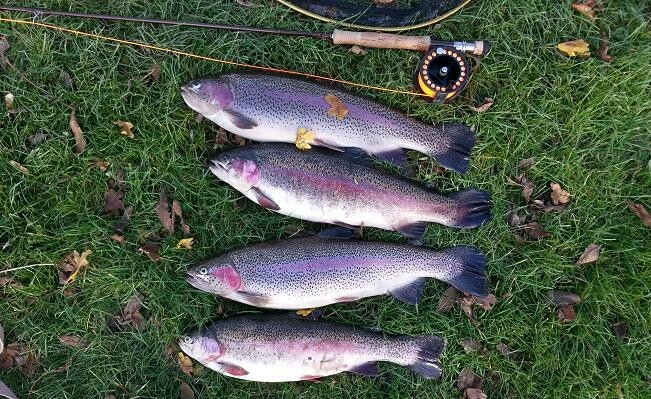 Peter made short work of this fight and scooped his limit rainbow the net. 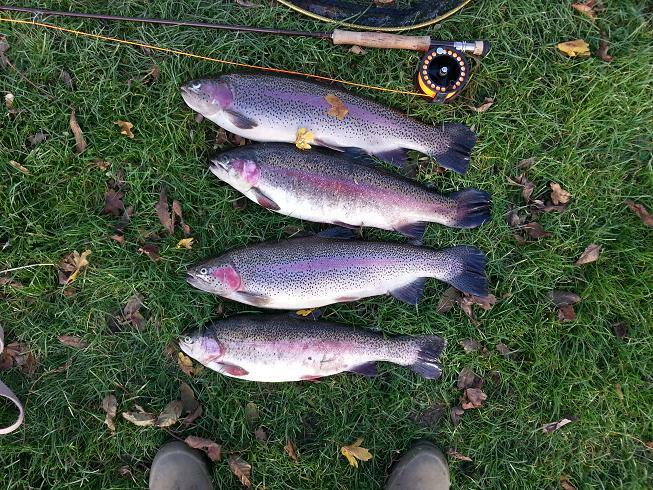 With this fish netted, it was time to retire to the clubhouse for Fishery Manager Wendy to get the cooking irons out to prepare a well earned lunch, while we looked back on a challenging session. A planned visit to Meon Springs in very rural Hampshire coincided with the windiest day for decades, forecast and when my driver and companion for the day, Peter collected me from home, Scotland was already being ravaged by 100 mph winds. Dead leaves were dancing in the lane, before being whipped into the air by sudden gusts, as we drove down the valley towards the clubhouse, which nestles in the hillside above the fishery. 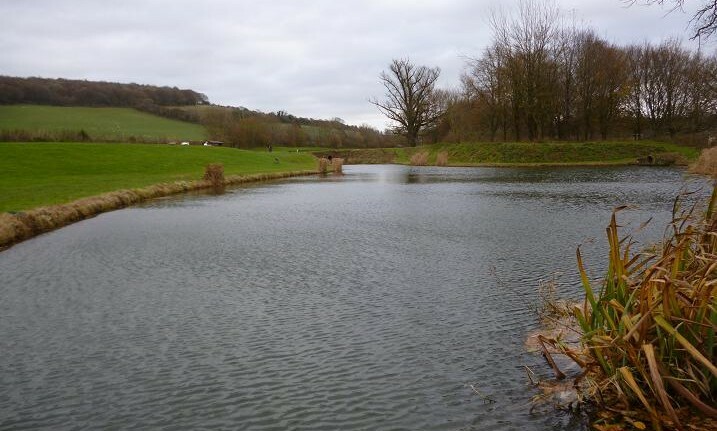 This commercial fishery consists of a series of small dams holding back the natural flow of an infant river Meon, as it meanders down the valley protected in the main by woods. 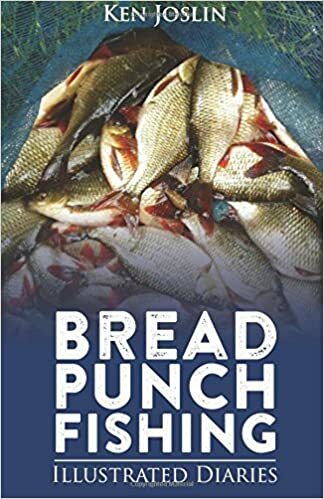 Leaving the comfort of the clubhouse, where a log burner was blazing, the wind was already rippling up the surface of the main lake and with sight of the number of blanks in the returns book fresh in our minds, a hard day was in prospect. 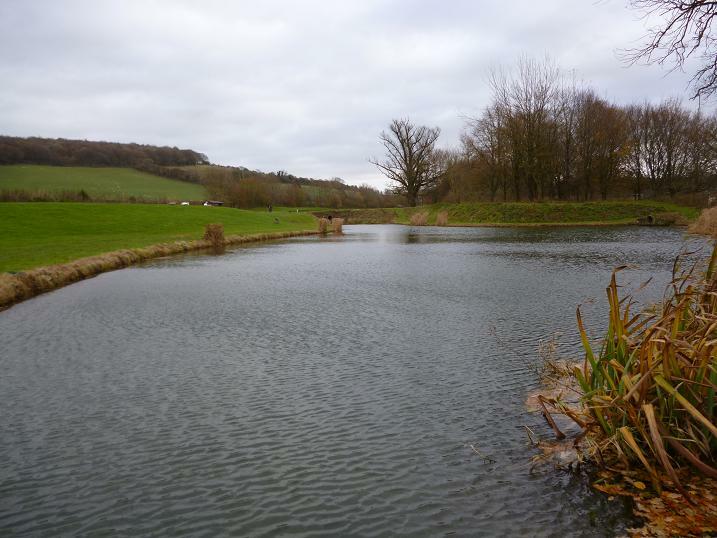 A chat with an angler, who had “tried everything without a touch” for three hours, made up our minds that the bloodworm nymph under an indicator, was the only chance to avoid a blank entry in the book. Without too much hope, I made a cast downwind and across, watching the indicator yarn bouncing across the ripples, giving the nymph life 18″ below. After a minute it slid sideways and under. A lift of the rod and I was playing my first fish. I looked to my right to see Peter’s rod was also at full bend. We were on the method again! The angler between us visibly sagged in disbelief. He’d been there for three hours working hard without a take and these two guys arrive and catch straight away. This was not a small fish and it patrolled the opposite bank at speed, making regular direction changes, before diving to the middle of the lake for a head shaking session, a sign of a lightly hooked fish. This might be my only catch of the day and if it wanted line I gave it, while in contrast Peter was bullying his across the surface, leaning hard onto his rod. Both techniques were successful. 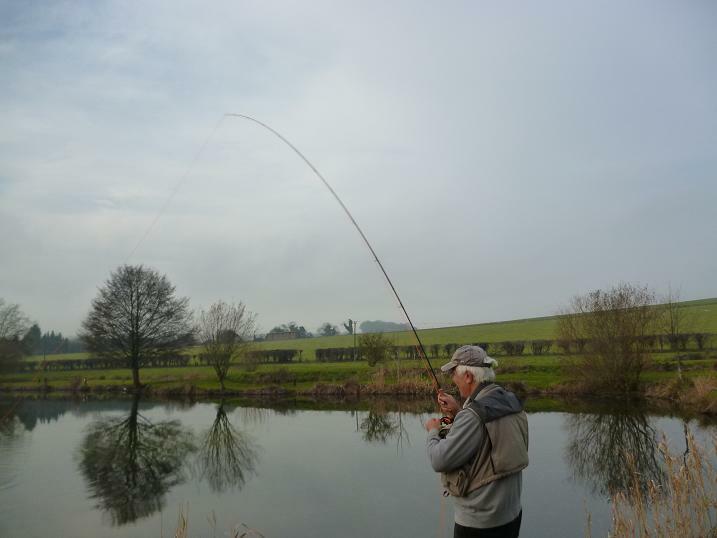 As I removed the bloodworm from this near 4lb rainbow, Peter came down for a look. 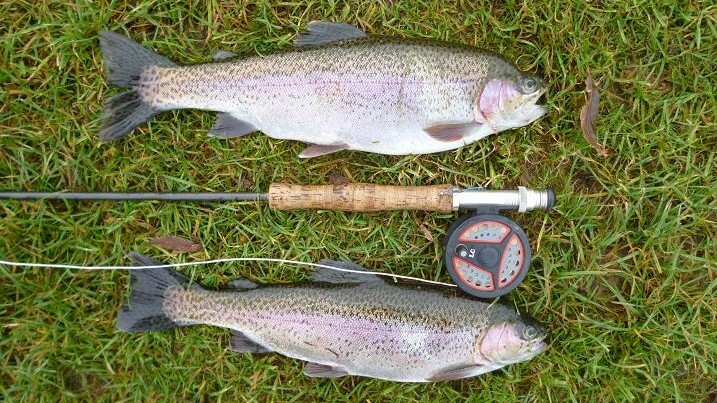 “Nearly as big as mine” he said and went back to his rod. Another cast, a two minute wait and the indicator disappeared again, as if by magic. A lift and a miss. Another cast down and across and it went again with a swirl. Missed again! 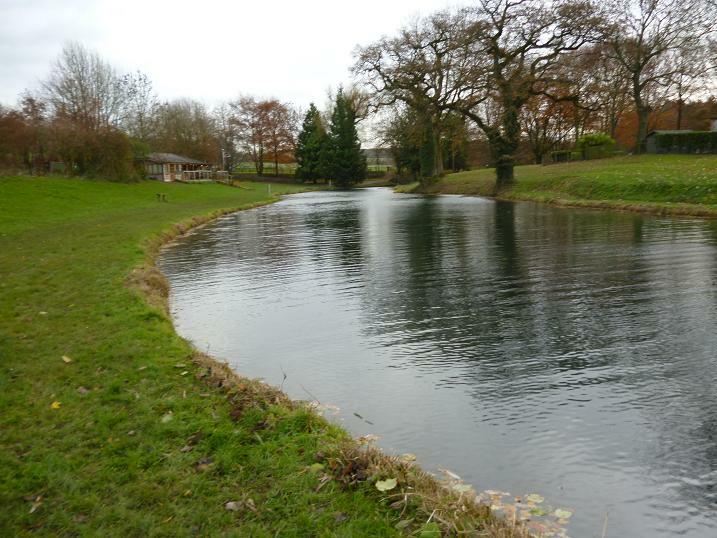 An instinctive return cast saw the nymph land in the swirl and it continued down, taken on the drop. A lift and all hell let loose, as another big rainbow made like an outboard motor across the surface. 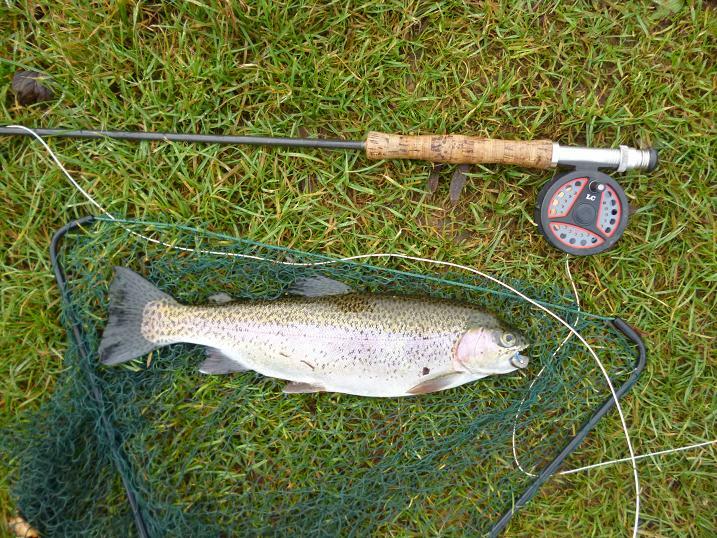 Convinced that this would soon be a lost fish, I hung on as it screamed line from the reel, fighting the now blowing gale, as much as the rainbow. 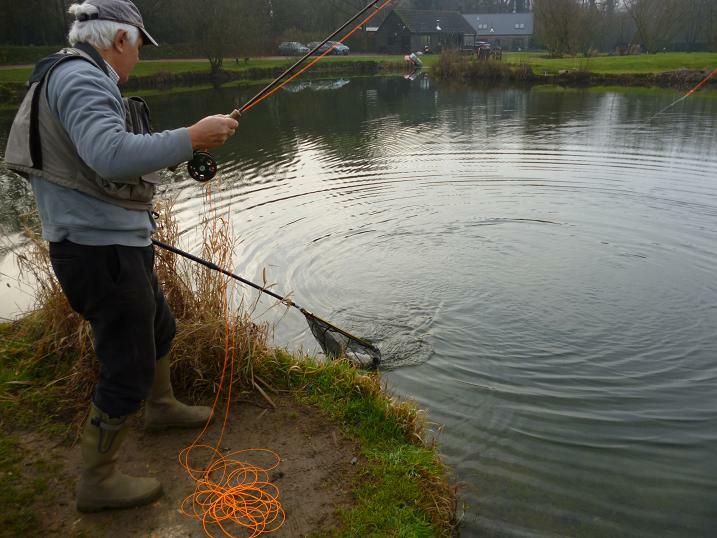 These Meon trout were in peak condition and commanded respect, this one leaping clear a few times before coming to the net. Not much more than half an hour had passed since making my first cast and I’d banked my two fish limit. Peter was still on one, having dropped a rainbow that was boiling on the surface, but was still getting takes. 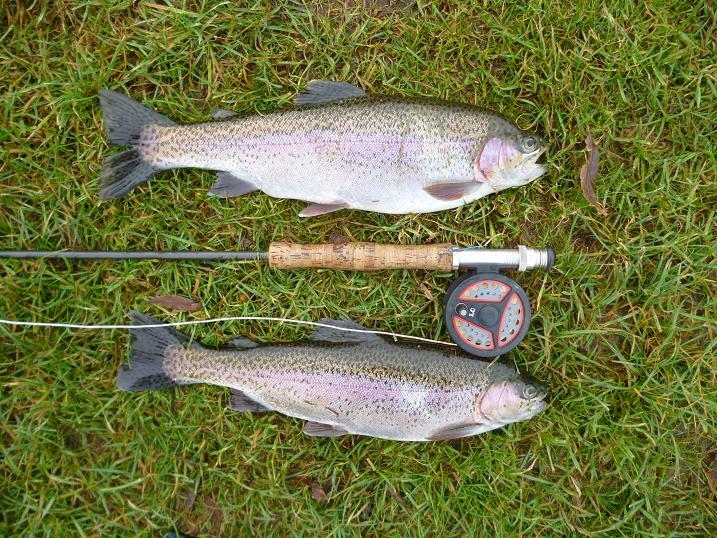 The stunned angler between us was busily tying on a blood worm nymph and I offered him some indicator yarn and my fish filled spot; carrying my trout back to the clubhouse to be bagged and weighed, 3lb 12oz and 3lb 14oz respectively. With my return filled and warmed by strong sweet tea, I ventured out again, this being my first visit, I’d decided to check out the catch and release section below the main lake. I stood and watched our new friend miss several takes, then continued up to Peter, who now had an even bigger rainbow on the bank estimating it’s weight at 5lb, all the others fishless. 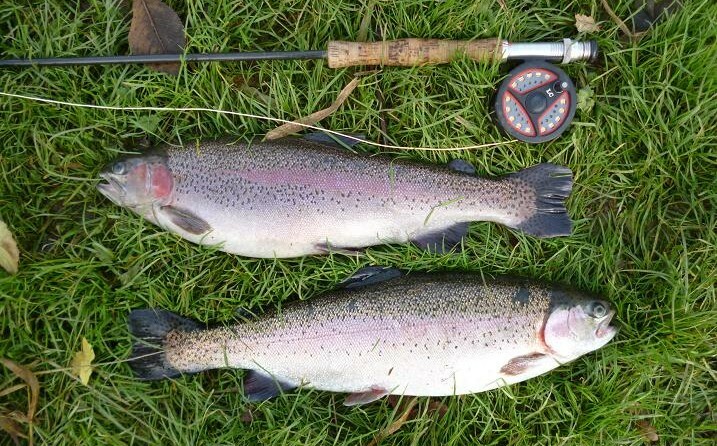 Peter smokes most of his trout and decided to fish on for four fish, but with wind now lashing the surface in all directions, it seemed unlikely he could get the presentation needed. The first section of catch and release water opens out to a pool and at the dam end I saw a nose appear among a raft of leaves blown into a small bay. A fish was working this area and I cast hard to the leaves, waiting for movement from the indicator. Five minutes later the indicator was snatched under and I missed it, lifting into thin air. Another fifteen minutes of waiting and watching, huddled beneath my fur lined cap against the wind blasts and it went again, this time skating a foot towards the leaf strewn bay. Unmissable, but I did. Giving up on the pool, I continued downstream, to sample the more natural river-like section , which I was informed had been stocked with 1500 brown trout, but the bloodworm failed to get a response and by now I was past caring about more fish, just getting the nymph to land anywhere I intended was becoming the overiding concern. On a spring afternoon this strip of water would be a delight, but early December in the midst of a howling gale, it was an endurance test. I made my way back up to the main lake and was relieved to see Peter playing his fourth fish. 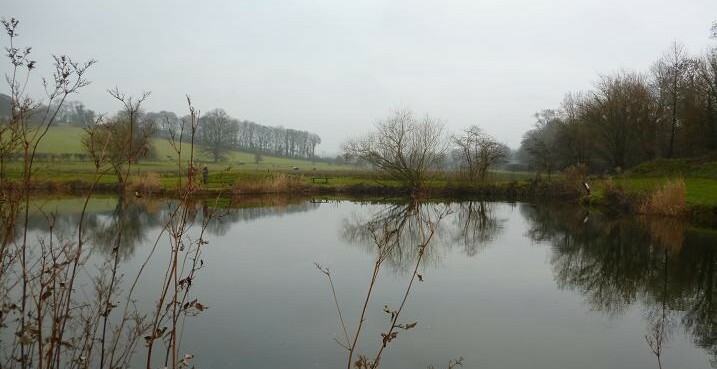 After a blank spell, he had raised the indicator to fish the bloodworm 3 ft below the surface and caught two in quick sucession, a trick not missed by the others, who were soon taking fish. Peter’s fish varied between 3lb 8oz and 5lb 4oz and with my two added to the mixed, the following day was destined to be a filleting and smoking production line.